The underlying problem of the seeming impossibility of humans cohabiting with the wild cougar harmoniously has surfaced again and it will continue to surface in debates between politicians on the right and the left and between animal advocates and animal hunters. It is a shame to see these deeply opposed attitudes in American society although very predictable. On the one hand you have the hunters. To an outsider like me, who likes animals, hunting the cougar seems like something out of a John Wayne movie of the 1950s. One of his early ones where he jumps on a stage coach and escapes marauding Apaches. Shooting the cougar seems bad enough to a person who likes animals but to do it with dogs who chase this magnificent and shy animal up a tree where it is shot at close range seems like the expression of a crazed person driven by bloodlust. How do people enjoy that experience? And yes, I know the hunters argue that they have to carry out their civic duties in “harvesting” the cougar like wheat in a field because if they don’t the cougar will attack livestock and pets. Of course hunters have failed to recognise that the conflict between farmers and the cougar is of the farmer’s making. They set up farms on cougar territory. And what about insurance policies? Why can’t farmers run a collective insurance policy that pays compensation to a farmer who loses livestock to a cougar attack? Wouldn’t that be a more harmonious way of living with the cougar who was in North America tens of thousands of years before headless human started chasing around trying to survive. 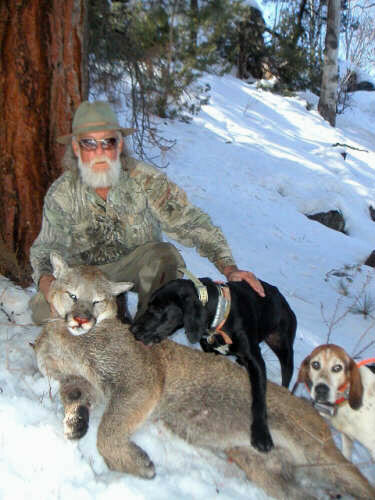 Well, California has moved, at least temporarily, into a more enlightened era and banned (subject to the governor’s approval) hunting cougars with hounds. A bill, number S.B. 1221, has been passed by the Californian legislature that prohibits hunting with hounds. Hounds are used to hunt cougars, bobcats and bears amongst other wildlife. Why does a single person, even though he is the top man, the governor, have the absolute right to throw all the work of the legislature into the bin and veto the bill? That also sounds stupid to me. If the politicians vote the bill into law, it should be law because these politicians represent the people. Moving on to the nearby state of Washington. They are going in the opposite direction. They have a law that prohibits hunting with hounds. It has been in force for the past 15 years. But the good people of Washington state found that the ban on hunting with dogs resulted in an increased conflict between cougar and the human. That is, there are more instances of cougars interfering with the human’s lifestyle. They became a nuisance so the the government of Washington backtracked and introduced a “pilot scheme”, in effect an excuse – the thin end of the wedge – to allow hunting cougars with hounds on a limited basis. The pilot scheme initially lasted for three years and was extended twice. Now the proposal is to allow hunting with hounds on a permanent basis during a hunting season. What this tells me is that the people of these states are struggling to find a solution to the problem of living in harmony with a large cat (40-70 kgs) that is living in the wild amongst people. It is like a seesaw. Hunting with hounds is in the balance. The truth is much worse – for the cougar. There absolutely will be more conflicts between the cougar and people. There has to be because year on year there are more people in these states and more human activity. So the current debate is only a temporary blip in the degenerating relationship between the cougar and the people. The only reason why the cougar is still living in the wild in the United States is because it is a very large place with a relatively low human population. But that is changing quickly. In the UK the number of people per square mile is around 650. In the USA the number is around 85. If the number of people per square mile in the USA was the same as in the UK, all the cougars would be behind bars. The cougar is already pushed out of the eastern half of the USA. It is only a matter of time before it is also pushed out of most of the west. I am not painting a negative picture. It is a realist picture. Note: I don’t have permission to use the photograph on this page. If the photographer tells me to remove it through a comment I will. Of the 10,000 photos on PoC I have done that about ten times. I do it when I feel it has to be done in the interests of the welfare of cats. This entry was posted in Puma, Wild Cat Species and tagged cougar, To Hound or Not to Hound Cougars, wild cat species by Michael Broad. Bookmark the permalink. The Cougars of the U.S.A and the Panthers of Mumbai National park face the same dilemma, both are in conflict with humans.”NATIONAL GEOGRAPHIC” produced an excellent documentary on this topic showing man-eating instances in Mumbai in comparison to Cougar attacks in U.S.A. Mumbai is the only city in the World to have a genuine National Park containing leopards within the City territory having the third largest population in the World.The “Bombay cat” must have been named with the Bombay panther as a role model.I only hope that Mumbai’s “Sanjay Gadhi National Park” doesn’t lose its entire leopard population akin to Cougars disappearing from the wild American forests, both victims of human encroachment into their habitat.Illegal slums and unauthorized apartment construction around the Sanjay Gandhi National park boundary is the main reason for occasional leopard attacks on humans in Mumbai. Thanks Rudolph. Yes, the large wild cat/human conflict is ever present and I am sure will gradually get worse. “Sanjay Gadhi National Park” is astonishing being so close to human settlements. Personally, it must be doomed in the long run because people won’t stop reproducing. It is that simple.